Palace Lagoon is a region in the Palace District in north Irukandji. It first began life as Arms of Patroklos but the name was changed at the same time as Hephaistion became Boyfriend Beach. The lives of Palace Lagoon and Boyfriend Beach were linked throughout, with the former serving as a northern beach playground for the palace. The beach was also home to the Hephaistion Beach Club. Famously, Palace Lagoon was a place of great myth, and the birthplace of a concept that continues to the present day. It occurred to me one day that the kingdom's architecture was very opulent and that I need to explain why an island kingdom had so much gold. I decided to create a natural gold horde that was hidden away from the world, and Palace Lagoon was the place to do it. Diving down underwater, one could see that the seabed was made of solid gold with fish swimming all about it. 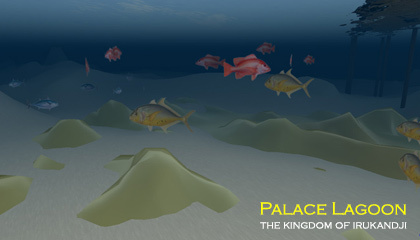 The theme of an underwater goldfield became part of the kingdom's culture. 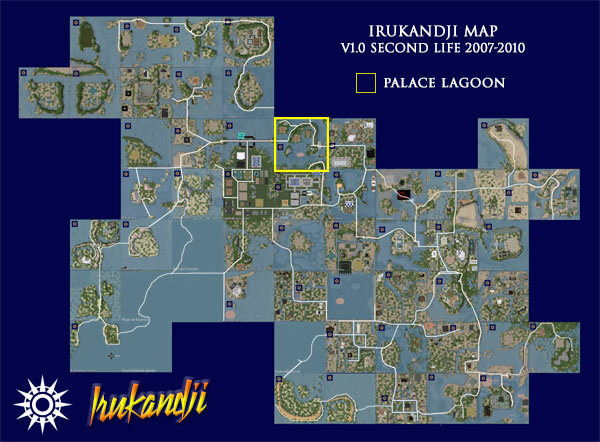 It continued five years later at Lagune d'Or in InWorldz, and then again in 2016 at Aratura City in DigiWorldz. Clockwise from east, regions adjoining Palace Lagoon are Valkyrie Island, Valkyrie Shoals, Boyfriend Beach, Split Rock Mountain, Byron Bay, and Coolangatta.